Splatball Hours are the most flexible of any paintball field in the Twin Cities. 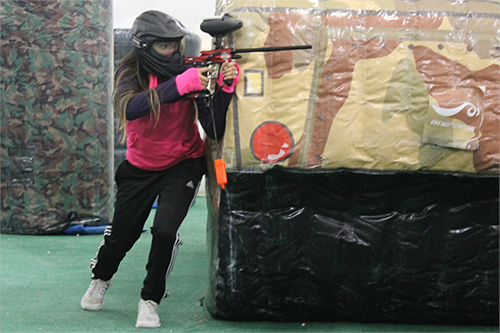 Our climate-controlled indoor facility makes us the perfect place to host a paintball party, day or night. Whether you’re planning a birthday party, bachelor party, or just looking to join walk-on play, we have a session for you. Reservations can be made for any time during our hours of operation. A reservation is not required to play at Splatball, but a pre-paid reservation has two advantages. First, we offer discounts to groups who pay in advance. Second, you’ll be guaranteed a spot and rental equipment by making a reservation. Reserved games also have the option of making their session private. A private session means your group will play among themselves and won’t be mixed in with other players. This is a great choice for new or young players. Groups of any size can make reservations. There is no minimum number of players required. Walk-on sessions are best for groups who simply want to walk in and play. The walk-on session is also great for groups who are looking for something to do, or a couple of players who want to mix in with a larger group of players. Please be aware rental players play separately from players who have their own paintball gun. You can expect to spend two to three hours at Splatball. If you’re planning to play on Saturday, we recommend making a pre-paid reservation through our online reservation system. If you have any questions about our hours, or questions about playing paintball at Splatball, don’t hesitate to give us a call at 612-378-0385. One of our party specialists will be happy to answer your questions and help you plan the perfect paintball party.